PCE Kato Chan & Ken Chan (JPN) in 07:44.1 by TaoTao. Kato-chan Ken-chan is a gem of a PCE game made by Hudson. Often abbreviated as "Kato-Ken" in Japan, this game is derived from a Japanese TV program, "Kato-chan Ken-chan gokigen TV". The main characters are Cha Kato (Kato-chan) and Ken Shimura (Ken-chan), who are famous Japanese comedians. 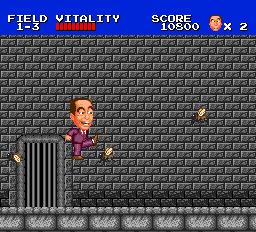 One particularly distinguishing feature of the game is the ability to attack enemies with farts! In this run, the author uses Ken-chan, though you will also see Kato-chan appear from time to time to be a nuisance to Ken-chan.